Let's give it up for Joe Wiggy who finished what was unquestionably the best season of his life with the half in Seattle. Joe ran big PRs at 5k, 10k, and 10 miles, and won a competitive 1500 at the Maryland Twilight meet in a near PR. Joe was understandably disappointed to end the season on a less than stellar note in Seattle, but he will be back in the fall ready to build off his considerable success this spring. And continued props to Lindsey for another great performance--well done! LJ proved at the Fathers Day 8k that she has a career in sports journalism ahead of her, but she's got a few more years left of competition left before she makes the move behind the microphone. We're planning the first annual All American Time Trial on Saturday at BCC. For those of you who haven't been following the onslaguht of press coverage this event has received, we're going to have a number of the B groupers attempt to run 5k on the track at 5 minute pace. We haven't set a start time yet, but we'll go as early in the am as is practicable so we can beat the heat. I'm still looking for pacers, so if you're in town and not running the time trial, and are willing and able to pace a few (or more than a few) laps at 75s, let me know. It looks like we'll have a nice night tomorrow, so we'll be fine to roll at 7:15 as normal (get to the track at 6:30pm to warm-up). The workout this week will be light on A groupers again. Karl will do 4 x mile at 5:00, with a 2:30 jog, and if anyone wants to join him, they're welcome to do so. The B group workout will be 1 x mile @ 5:00, 2 x 800 @ 2:25, all with a 400 jog, and 6 x 400, 2 @ 70, 2 @ 68, 2 @ 66, all with a 200 jog. GRC's Joey Wiegner (right) is set to compete in the Dodge Rock ‘n’ Roll Seattle Half Marathon tomorrow morning. Wiegner, from Twinbrook, Md, was initially scheduled to run with teammates Luff, and Dusen last week at Grandma's Marathon, but a wedding forced the Lock Haven grad to change his plans. This morning Wiegner flew solo to the Pacific Northwest and hopes for a "big" personal best. According to Coach Jerry Alexander, "Joe is in the best shape of his life and he's hoping to cap off a spring season that saw him run big PRs at 5k, 10k, and 10 miles." Alexander added, "Joe is going into this race with no expectations other than to run hard and compete, but there's every reason to think he has a shot at turning in a GRC seasonal best. 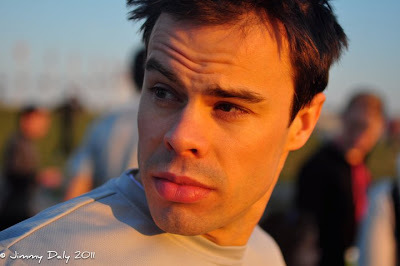 This will be a good test for Joe as he contemplates moving up to the marathon this fall." The gun goes off at 7:00am local time (10:00am EST). UPDATE: Wiggy has self described "off day" and runs 1:09:52 (un). Starts aggressive (10:00 for two) but splits are up and down on roller coaster race. I am running from the Store tomorrow at 9am. I was thinking of 15-16 on Sunday, but need a spot...maybe Old Angler's Inn at 9am? Any other suggestions? Dickson Mercer reports that Arlington's Michael Wardian will run the baddest of all ultras: BADWATER. Read the article HERE to get a glimpse of Wardian's training leading up to his recent PR in Duluth. I can’t say enough good things about the Father’s Day 8k. First and foremost, I want to give special thanks to Race Director Jake, and his able assistants Murph and Charlie. I know that those guys put a tremendous amount of work into the race, and they deserve to be celebrated for their great work. I was also extremely impressed by the fact that so many GRCers volunteered, including many folks who do not come to the workouts very often, if ever. That Jake and his team were able to motivate so many people to work on a Sunday night is a testament to their powers of persuasion, and to the loyalty so many folks feel to the team. That kind of loyalty does not happen by accident, and clearly Jake, Murph, and Charlie are doing something right. It was a great night all the way around, and you should all be extremely proud that you were able to stage such a great event. As for the race itself, Kate, Susan, and Dave Burnham deserve a lot of credit for running hard under less than ideal circumstances. Kate loves to race and was glad to be out there, but I have a strong suspicion that Dave and Susan would have been just as happy to hand out water than to run a race in the heat of the day on a slow course, and I appreciate their willingness to take one for the team. I instructed young Jacob to tell Dave that we don’t tolerate losers at GRC and that he’s off the team as a result of his second place finish, but apparently Jacob was too busy giving media interviews and entertaining his legion of fans to deliver the message, so I expect Dave will be with us well into the future. And lest we forget the other race this weekend, congratulations to Sam, Karl, and Paul for an outstanding effort at Grandmas. Sam finished a fantastic spring with another excellent performance, going through 10 miles only about 10 seconds slower than he did at Cherry Blossom, but this time he had another 5k to go. Sam has raised the bar of expectations for the future, and he is on his way to breaking through to the national class level. Karl proved once again that he has the toughness and desire to make it back to the Trials, and with a couple of months of good health and solid training, I wouldn’t bet against him going sub 1:05 in September in Philadelphia, even as he trains through the half in preparation for running a full a few weeks later in Chicago. Paul proved that he is back to race fitness with a very solid run, and he is also a real threat to break 1:05 in the fall if he chooses to run another half. Well done to all! As for the workout, let’s plan to roll at 7:15 on Wednesday. It looks like we won’t have an A group workout again this week, but we should have a large B group ready to get after it. Let’s shoot for 8 x 800 with a 400 jog, 2 @ 2:32, 2 @ 2:30, 2 @ 2:28, 2 @ 2:26. I’ll send the women’s workout separately. The Rockville Rotary Twilight Runfest, one of the region's premier summer road races, will be held on Saturday, July 16. The team competition in this festive 8K road race is spirited, with the likes of Falls Road and PRR fielding teams at last year's event. Teams racing in the open co-ed team competition must include five or more runners with at least two men and two women scoring. Given the depth and talent of the GRC Race Team, we have no excuse but to make a strong showing at this competition. The city holds a street festival on Rockville Town Square at the finish (which is but a stone's throw from the marvelous yet affordable White Flint Mall Food Court) and rumors abound that there will be a social of some sort after the race. We need to put together a roster so please post up or SEND ME an email if you're interested in running this race. UPDATE: 8:30 a.m.: WRR race report. GRC women took the top two spots in tonight's Father's Day 8K, held on the C&O Canal Towpath. More than 250 runners participated. Kate Dart won the women's race in 30:26. Susan Hendrick was second in 30:51. Dave Burnham led GRC men, finishing second in 25:50. Andrew Dumm won the men's race in 24:58. A day after qualifying for the U.S. Olympic Marathon Trials at Grandma's Marathon in Duluth, Minn., Michael Wardian took third in 26:04. Overall results are posted here. Age group results are here. UPDATE: This corrects an earlier version in which race times were reported incorrectly and includes splits and commentary. Sam Luff's 1:07:08 debut in the half marathon lead all GRC harriers at the Garry Bjorklund Half Marathon this morning in Duluth, Minn.
Karl Dusen was close behind, running 1:07:58. 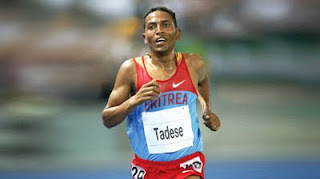 Having survived a nasty virus the last few weeks, Dusen admittedly no longer thought of the race as a qualifier attempt, but rather as a test to see how fast he could run, as I guess most races are in the end. Paul Guevara's 1:08:47 is a remarkable time given that he was splashing around in a pool a few months ago and has raced twice since then. They reportedly, have "gotta be happy with that." Tex and Karl plan to make attempts at the qualifier later this year, Tex at the former Philly Distance Run, now-overpriced Rock and Roll Philly Half in September. Speculation is that Dusen, who grew up with Filthydelphia, will join him. No word on Diddy, because I never asked him what his plans were, but I imagine he will try again in the fall. MORE: "The day was good, we just weren't ready to run 65 minutes". Luff, Dusen and Tex were 4:57 at the mile, behind a pack of Kenyans and elite Americans. Dusen realizes pace is too quick today and slows down. 20:10 at 4 for Luff. Tex drops back some. 25:17 at 5, 31:17 at 10k for Luff. Shortly thereafter, Luff is running alone, but has a tailwind, keying off of other runners. 50:56 for 10 miles. Luff's legs then settled into 5:10s. ANALYSIS: GRC Racers claim the trip was (is) good and the race was run "hard", but that neither of the 3 were ready to run 4:57s for 13.1. Still, a fine way to end the season for some and start it for others. 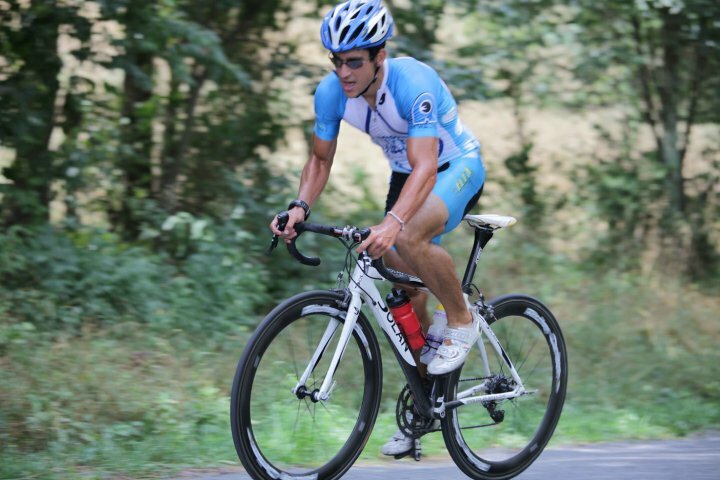 Karl once again had the misfortune of getting sick just as he was reaching true race fitness, and considering that he has not been able to finish a workout in a month because of his health problems, this was a remarkably positive performance. At the end of April Karl was at a point where 1:05 was a real possibility, but with his illness, there was no way it was going to happen today. That being said, he's got the whole summer to get back to the level he needs to make the Trials. I'm confident he will get on the starting line in the fall with a great shot to qualify. Sam continued his breakthrough season with another excellent performance. He was in uncharted territory at this distance but took his shot and ran very, very well. Sam and I have talked about continuing his momentum from the spring into the future, and while we haven't made any decisions about what to focus on for the fall, there's no question that Sam is ready to move to the next level in the coming year. Paul had a great run considering that this was his first competitive race in over 6 months, and I'm very encouraged about his progress. Paul will continue to get stronger and there's every reason to think he will have a big fall. LATE BREAKING: 50 degrees, light rain and NE wind to greet runners in Twin Harbors, MN at dawn. This weather could be ideal for fast times. The GRC race team may prowl the track at Bethesda-Chevy Chase, the trails of Rock Creek Park and the C&O Canal Towpath, but it is making a name for itself in Duluth, Minn. this weekend. Members of the team are making yet another trip to Grandma's Marathon. Previous races have included a victory in 2009's race for Chris Raabe and Jake Klim's marathon debut. Saturday morning, Sam Luff, Karl Dusen and Paul Guevara will take their shots at the Olympic Marathon Trials qualifier in the Garry Bjorklund Half Marathon. Raabe is apparently going after the marathon again, though he has already qualified for the trials. Our intrepid trio must run under 1:05:00 to qualify- 4:57 pace. Karl Dusen was close to that pace at the Credit Union Cherry Blossom 10 mile run in early April, a remarkable improvement over the previous few months. In December he could barely finish a 10k almost 20 seconds per mile slower than he ran at Cherry Blossom. 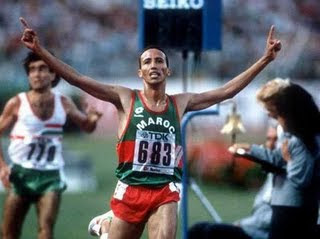 Now he's on the doorstep of making a repeat trip to the marathon trials. Sam Luff was close behind Dusen at Cherry Blossom, and has shown outstanding range this spring, running 14:15 a few weeks later, then 30:13 the next week. After a short racing break, he has been absolutely demolishing workouts and his debut in the half is going to be memorable. Paul Guevara has made a name for himself in the midwest, particularly in Minnesota, and aims to follow up on his 2:21 debut at the Twin Cities Marathon last October with another fast race, a few months after being sidelined with a stress fracture. Minnesota Paul has a VO2 max higher than the U.S. trade deficit and he is an honest-to-God baller. Any or all of these men can come back with a ticket to Houston. Check out their Twitter feed on the right side of the blog for updates. Finish times and splits will naturally be up on the blog as soon as possible because face it, we're running nerds. We have created a Twitter account for the team (@Grc_race_team) and will start off the tweets by detailing our trip to MN. In the future, other traveling GRCers can use this to update the team on their adventures. If you have another account, please follow this handle. Check out our updates for this trip too! I need one volunteer on SATURDAY to help me retrieve tables from the rental shop in Arlington and load them into my truck. The rental store is not open on Sunday. We can head right over after the run/meeting at the store in the morning. Drop me a note if you can help - david.j.burnham@gmail.com. WASHINGTON, D.C. - Most members of Georgetown Running Company’s racing team will be on the sidelines, not the starting line, during Sunday’s Father’s Day 8K. Their duties for the GRC-sponsored evening race - which raises funds for the racing team - will mostly include handing out water, organizing, timing, instructing and cheering on the race’s hoped-for field of 300 runners. A few lucky members of GRC’s racing team – Dave Burnham, Susan Hendrick and Kate Dart - will do their teammates the honor of racing. 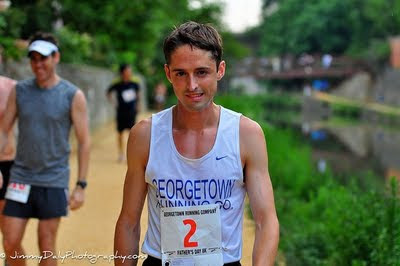 GRC’s Joe Wiegner won last year’s Father’s Day 8K, held on a hot night, in 24:52. He was followed by Michael Wardian - an Arlington, Va., resident and the world’s fast mega-marathoner – who picked up his youngest son Pierce near the finish and carried him across the line in 26:01. Wiegner will not be back to defend his title, as he is tapering for a half marathon in Seattle the following Saturday. Wardian, however, will take another shot at victory on Sunday - just a day after he goes after an Olympic Trials qualifying time at Grandma’s Marathon in Duluth, Minn.
Burnham, a former All-Ivy League runner for Dartmouth College, took fifth at last Saturday’s Lawyers Have Heart 5K in 15:35. 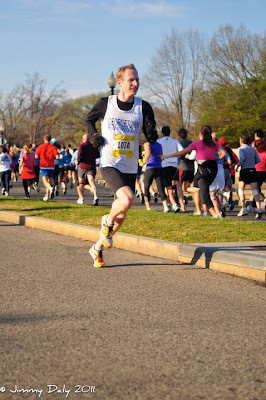 In the spring he posted 31:13 at the Pike’s Peek 10K and 51:46 at the Cherry Blossom 10 Mile Run. He has personal track bests of 14:14 for 5K and 29:41 for 10K. Another recently-announced member of the men’s elite field is Andrew Dumm. The 2008 Marine Corps Marathon champion clocked 2:20:46 at the 2010 Bank of America Chicago Marathon, and has run under 30 minutes for 10K on the roads. Dart took second at last Saturday’s Beat the Deadline National Press Club 5K in 18:22. She has a personal 10K best of 37:34. Hendrick, who competed for Georgetown University during graduate school and was a two-time Ivy League champ for Columbia University, took third at the National Press Club 5K in 18:30. She also placed fourth at the recent Capitol Hill Classic 10K in 38:45. Her personal best for 5K is 16:50. Kayley Byrne, a former runner for the College of William & Mary, took the women’s title at last year’s Father’s Day 8K in 30:38. As of press time, she was not registered to defend it. Contested during National Men's Health Week on the C&O Canal Towpath Trail, the out-and-back, flat-and-fast race will start and finish in historic Georgetown. Updates regarding the Father Day 8K’s elite field will be issued in coming days. All - Saturday we'll be having an All Hands Run at the Georgetown Store. We'll run the Father's Day 8k course and provide information you'll need to know about the upcoming race during and after the run. PMurph will be sending everyone an email this week with their respective race day duties. Please try and be at the Store by 9am. 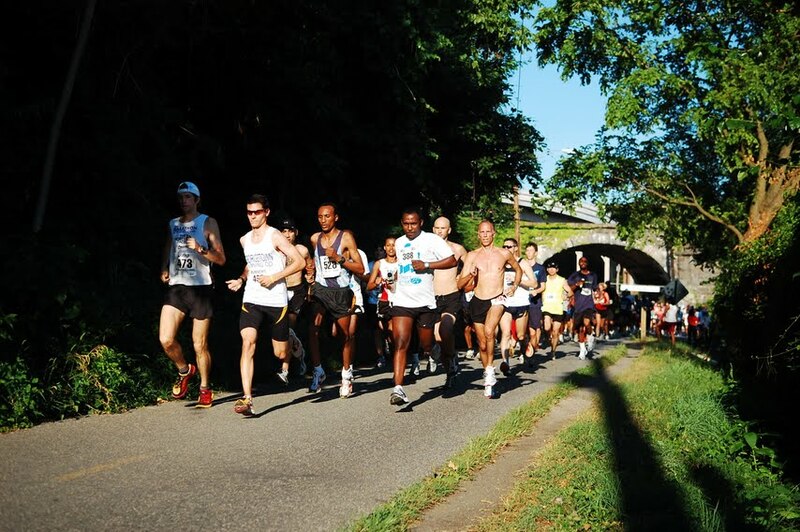 Potomac River Running Twilight Festival four-miler is at 7 p.m. Saturday in Ashburn. The starting line is at 20099 Ashbrook Pl. Registration is $30, $35 on race day. 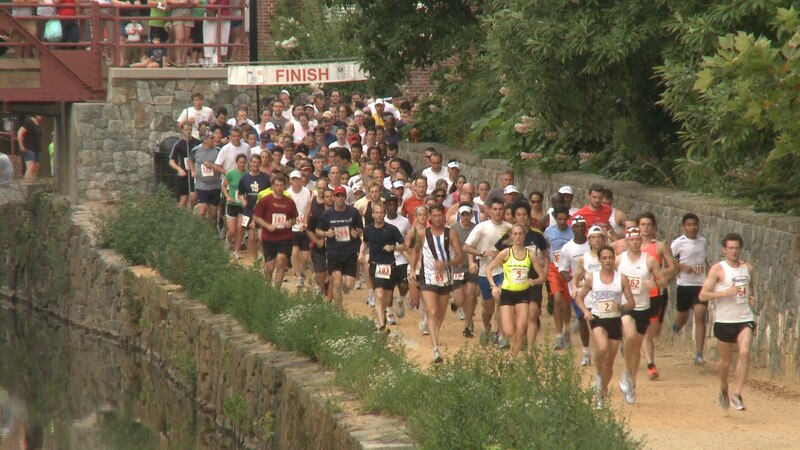 Father's Day 8K takes over part of the C&O Canal Towpath at 6:30 p.m. June 19. The starting line is at Potomac and Grace streets NW in the District. Registration is $30, $40 on race day. Rockville Rotary Twilight Runfest 8K will head out from Rockville Town Center at 8:45 p.m. July 16. Registration is $31, $36 July 1-16, $45 on-site. Crystal City Twilighter 5K starts at 8:30 p.m. July 23. The starting line is between 20th and 23rd streets on Crystal Drive in Arlington. Registration is $40, $45 on race day. Glow for Hope 5K/10K is at 8:30 p.m. July 30 at Virginia Gateway Atlas Walk, off Lee Highway in Gainesville. Registration for the 5K is $35, $40 after June 30. Registration for the 10K is $40, $45 after June 30. RunStock 5K kicks off at 7 p.m. Aug. 20 at Butler Stadium in Quantico. Registration is $35, plus a processing fee. So, most people are racing at the Press Club 5k, eh? Well, I'm not. And I'm sure some others aren't either. I'll be looking to run 10mi from the store and I know Michelle will be there too. LJ finished 40th overall, 4th Pro female. - Emil Zatopek, at the start of the 1956 Olympic Marathon where temperatures reached 85 near the end of the race. RELATED: practice starts at 7pm at B-CC.